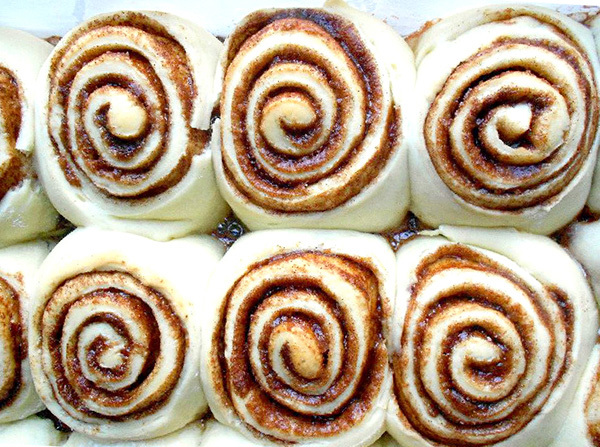 The simple part of these cinnamon rolls is due in part because you use ready-made dough. You can find it in the frozen bread section of grocery stores. I’ve made these rolls for Christmas morning for 35 years. I usually try and make them on Christmas Eve day. They are always greeted with a huge smile. Happy holidays to all Courier readers! Thaw the frozen dough. Roll out the dough on a floured surface to a rectangle shape about 12 by 15 inches. Mix the butter, spices and sugar in a bowl until well blended. Divide filling into thirds. There will be three loaves of bread dough to spread the mixture over. Spread the sugar mixture over the rolled-out dough. Roll into a jelly roll shape. Cut into 10 slices and place onto a greased cookie sheet. Cover with a clean dishtowel and allow to rise for 30 minutes until doubled in size. Brush tops of rolls with warmed milk or cream. Bake in a preheated 375-degree oven for 15 to 20 minutes until golden brown and cooked through. As the rolls cool, prepare the frosting by mixing the ingredients together in a bowl. Spread frosting over the cooled rolls. Enjoy!